Remove mozzarella and nduja from fridge and allow to reach room temperature. Tip the flour onto a work surface. Make a well in the middle and you in beaten egg. Using hands, start working in the flour from around the well. Continue working until a smooth and silky dough is formed. Wrap well in cling film or baking paper and rest in the fridge for at least half an hour. Cut mozzarella into bite sized pieces. 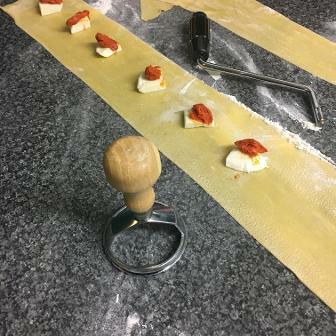 When ready roll your pasta either through a machine or using a rolling pin, until around 1mm. Along the length of one sheet, place a piece of mozzarella topped with around half teaspoon of nduja, depending on your taste. Stamp or cut out each raviolo. Stamp or cut out a corresponding piece from the plain pasta sheet. 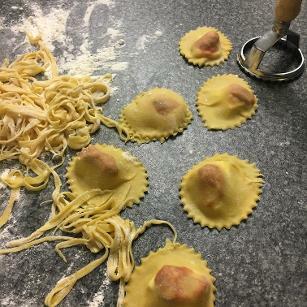 On each filled piece, lightly brush the exposed pasta with water. Top with a plain piece of pasta, gently pressing around the filling to squeeze out any air. Seal. Cook the ravioli in batches in a large pan of salted boiling water (allow around 1 litre of water for each 100g of pasta). Scoop out each raviolo when it floats to the top of the water. Alternatively, make tagliatelle from your fresh pasta dough and make a tomato sauce. Pour 200g tinned tomatoes per person into a pan over a low heat - add 75g mozzarella per person and around 35g of ndjua per person...dependent on how spicy you like your food, stir frequently until the mozzarella has melted. Add cooked pasta to the sauce.